Rashid Ali is a singer, guitarist, musician and composer, who first became known for the hit song Kabhi Kabhi Aditi from Jaane Tu Ya Jaane Na. 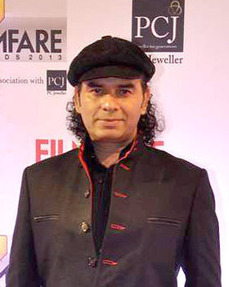 Mohit Chauhan is an Indian playback singer, most known for his work for Bollywood, Tollywood, & Kollywood movies. He was also part of the Indipop band Silk Route. Chauhan is a two-time recipient of the Filmfare Award for Best Male Playback Singer and three times Zee Cine Award For Best Male Playback Singer. He has recorded songs for film music and albums in various Indian languages and has established himself as a leading playback singer of Indian cinema. Hans Raj Hans is an Indian singer turned Politician. He is a member of Bharatiya Janata Party and a recipient of the civilian honour of Padma Shri. Mausam is a 2011 Indian romantic drama film written and directed by Pankaj Kapur under the Vistaar Religare Film Fund banner. The film stars Shahid Kapoor, opposite Sonam Kapoor in the lead roles. The film was originally scheduled to release on 16 September 2011, but due to the delay in obtaining the NOC from the Indian Air Force, it was pushed back further by a week, releasing on 23 September 2011. Vishal Dadlani - "Tu Meri" from Bang Bang! Jodhaa Akbar is a 2008 Indian historical romance film, co-written, produced and directed by Ashutosh Gowariker. It stars Hrithik Roshan and Aishwarya Rai in the lead roles, with Sonu Sood, Kulbhushan Kharbanda and Ila Arun in supporting roles. The shooting for the film started at Karjat and released on 15 February 2008. Karthik is an Indian playback singer. Karthik started his professional career as a backing vocalist and has since been working as a playback singer. He has sung in multiple languages including Tamil, Telugu, Malayalam, Kannada, and in other languages like Odia, Bengali and Hindi. Karthik is known for his versatility in the industry which gave him opportunity to sing a variety of songs. Arijit Singh is an Indian playback singer, music director, score composer, Music producer, recordist and music programmer. He sings predominantly in Hindi and Bengali, but has also performed in various other Indian languages. Singh is regarded as one of the most versatile and successful singers in the history of Indian music and Hindi cinema. The GiMA Best Male Playback Singer Award is given by Global Indian Music Academy as a part of its annual Global Indian Music Academy Awards for Hindi films, to recognise a male playback singer who has delivered an outstanding performance in a film song.